"Curie museum lifts veil on the glory days of physics"
A museum scarcely bigger than a Paris flat sheds light on a momentous era for physics, a time of heroic individuals who made extraordinary discoveries but often at hideous risk. 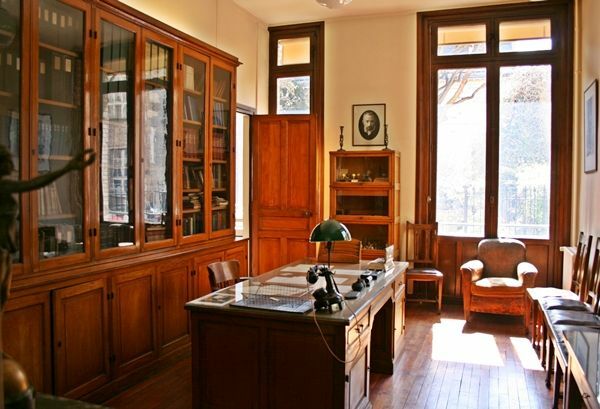 Within the walls of the former "Radium Institute" in the city's Latin Quarter is the preserved laboratory of Marie Curie, central figure of the greatest dynasty in modern science. The Polish-born genius, her husband Pierre, their daughter Irene and son-in-law Frederic Joliot were colossuses of physics and chemistry, between them notching up five Nobel prizes in just over three decades. Arriving as a student in Paris in 1891, Marie Curie experienced grinding poverty, xenophobia and hostility from the scientific establishment; at her death in 1934, she was a mega-star, mourned by the public and showered with honours. The Curies helped rip aside the veil hiding radioactivity, even coining the term for it. They discovered two new elements, polonium and radium, and made artificial radioactivity from stable elements such as boron and magnesium. They contributed hugely to health, setting up mobile X-ray machines for hospitals on the World War I trenches. And they walloped cancer, pioneering the first studies into isotopes to kill tumorous cells. Stepping into Marie Curie's lab is to be timewarped to the era of horizon-sweeping ideas and men and women with a restless, questing spirit. "When I first went into her office, into the sanctuary, it was almost like being in the presence of something sacred," Claude Huriet, president of the Institut Curie, which runs the museum and famous Curie cancer hospital, told AFP. In 1903, Marie Curie became the first woman to receive a Nobel Prize, sharing the physics award with her husband and a pioneer in radioactivity, Henri Becquerel. Eight years later, she became the sole winner of the Nobel Prize for chemistry. She remains the only individual to win a Nobel in multiple sciences. The two preserved rooms are part of the 150-square-metre (1,600-square-feet) Musee Curie, opening after a two-year refurbishment paid by a $1-million (787,000-euro) legacy by the Curies' younger daughter, Eve, who died in 2007. The museum gives a glimpse of an age of derring-do and making-do that compares starkly with today, when the search for the Higgs Boson has cost at least $6 billion and mustered 5,000 physicists. Go back a century, and physicists often had to make their own instruments—wonderful gadgets of brass and mahogany—just to be able to measure their own experiments. Chemists employed an on-site glassblower to make test tubes. Pierre and Marie had a ramshackle building—"a cross between a stable and a potato shed," sneered visiting German chemist Wilhelm Ostwald—where they carried out a now-legendary search for radium. They hauled in a tonne of pitchblende, a radioactive slag, from a mine in Bohemia and separated it in the shed, boiling up the material with toxic chemicals and stirring it in a cauldron with a heavy iron bar. After three years' labour, they had isolated one-tenth of a gramme of radium chloride. The building had no safety measures, was poorly ventilated and even let in the rain. At night, unaware of the peril, they admired the fruit of their work as it lay on a pine table: tubes of radium fragments that exuded a pretty bluish "fairy-like glow," in Marie's words. Even today, the notebooks in which they recorded their work from 1897-1900 are so radioactive that any scholar who wishes to consult them at France's National Library has to sign a certificate that he or she is doing so at their own risk. It is no surprise that Pierre Curie, who was accidentally killed by a horse-drawn carriage in 1906, showed many symptoms of radiation sickness. But at that time nothing was known about ionising radiation, or particles that snap DNA bonds in cells, turning them cancerous. "After (the) Chernobyl (disaster in 1986), people associated radioactivity with fear. But in those days, it was completely different, people thought that radioactivity was simply fantastic," said museum director Renaud Huynh. In the 1920s, posh families would buy special taps with radium salt tablets to make their drinking water "curative". Wealthy women would buy "Tho-Radia" beauty cream created by a "Dr Alfred Curie" (no relation to the Curies). And "sexually weak" men would be urged to insert "Vita Radium Suppositories" to restore potency. In the late 1920s, the love-fest for radioactivity faded as its dangers became clear. But awareness came tragically too late for Marie Curie. After years of exposure to radioactive elements and X-rays, she died of leukaemia in 1934 at the age of 66. Less than 22 years later, the same fate awaited Irene, aged just 58.